The FA Cup Final this weekend is one of the country’s great sporting events; watched by football fans all over the world. The competition began in 1871, at a time when the rules of the game were still evolving, the centre circle and half way line weren’t marked and there were no free kicks or penalties. The first final was held at the Oval in Kennington and saw Wanderers play the Royal Engineers in front of a crowd of just 2000 fans, with Wanderers scoring the winning goal. This weekend it’s underdogs Wigan Athletic taking on the might of Manchester City at Wembley stadium, in front of a crowd of 90,000! This fantastic poster was created by the artist Eric Fraser to promote the 1928 FA Cup Final. It was posted inside underground trains, in the panels above the windows and the glass partitions by the doors. Designed to increase passenger numbers and boost leisure travel, panel posters were printed in large numbers and only displayed for a few weeks ahead of an event. Fraser has skilfully included an amazing amount of information in this remarkably simple design. Set behind the goal, the low viewpoint allows for a panoramic view of the stadium. 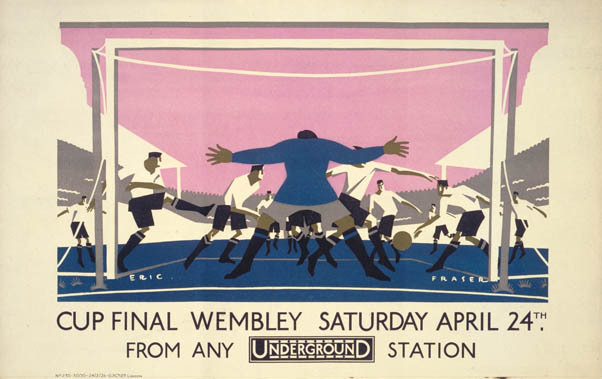 As the players bear down on the goalkeeper and the ball hurtles towards the back of the net, Fraser’s illustration captures the suspense and excitement of a cup final match. Even the iconic twin towers of Wembley’s original stadium are visible on either side of the goal posts. Wembley stadium was built in1923 for the British Empire Exhibition, which took place the following year and as the popularity of spectator sports increased, people flocked there to see there favourite teams and activities. Eric Fraser designed murals for the British Empire Exhibition and established a successful career as one of the country’s leading illustrative artists. He created many illustrations for the Radio Times, inspired by the sounds and ideas expressed over the airwaves, during a golden age for Radio. He also designed posters for Shell, the General Post Office and the Ministry of information and was well know for inventing a character called Mr Therm for the Gas, Light and Coke Company in 1932. Excellent commentary which really brings the story and history behind the poster alive. Love the angle of the image and the colour of the sky. I think this poster has aged very well indeed, you would have no idea it’s almost 90 years old!